Skateboard + Blog = SKLOG? Below is the archive of random skateboard thoughts that crossed my mind in 2017. 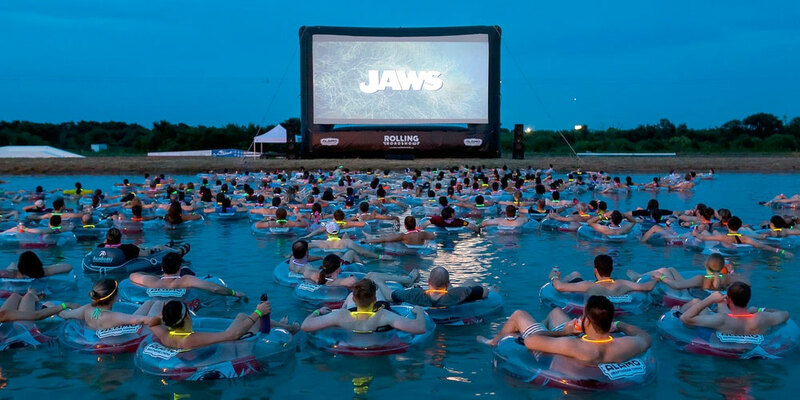 Would you watch Jaws on a huge outdoor screen while floating in an inner-tube? Jaws On The Water is an outdoor showing of Jaws on a huge drive-in sized screen. Unlike a drive-in, the seating at this event is in tune with the movie. Held at a water park, you float in an inner-tube as you watch the film. At first glance, I thought this was a phenomenal idea. It seemed even better when I discovered the location was at a water park and the ticket includes some time to explore and enjoy the water park before the film. Then it occurred to me, that I'd rather be sitting in my car at a drive-in. Drive-ins are iconic, rare and a lot of fun. Best of all... no one will pee in my car. While floating in a large pool full of movie-goers, I can't guarantee everyone will use a restroom as needed. The tagline to this event says it will test your fear of sharks. It might test my fear of sitting in urine. Kodak is trying to bring back the Super-8 film format and is eyeing skateboarding I loved the Bones Brigade videos of the 1980s. Bringing skateboarding from the parks and streets into homes via VHS was a boon to the sport and intensified the celebrity of those appearing in them. Stars were born via video as they were able to showcase their skills to huge audiences. I remember an interview with Tony Hawk where he was discussing the evolution of desktop video and how it was enabling him to make skateboard videos in a whole new way. The Video Toaster from Newtek brought amazing technology to computers used in homes. Desktop publishing was changing the way people could present information and the same shift was coming to video. Today we don't thing twice about sharing video to the masses from our phones, but back in the day, video was a tricky proposition and those who excelled at it could ride the wave further and reach more eyes. Kodak has reintroduced the Super-8 format that was popular in the 60s and 70s. Occasionally, one finds a filmmaker who uses this format to create a tone. Kodak wants to bring this to more filmers and has a new camera and development process for the modern era. 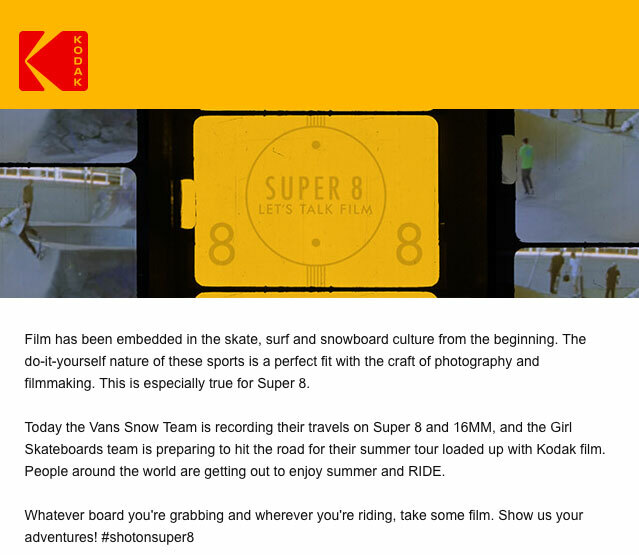 I recently received an email from Kodak that targets skateboarding as a logical outlet for Super-8 filming. I'm a big fan of retro technology and love to see it surface in new ways. Kodak is doing just that! I'm interested to see if some of the skate companies will give Super-8 a try and incorporate it into their next release. I'd love to see this, but the internet has ruined the former concept of skateboard videos. It used to be a 30 to 60 minute film showcasing the company's riders. These days, video is released in tiny chunks. Apparently few skaters want to sit down and watch a long-format skate film. They seem to watch snippets on tiny phone screens via tube sites. Perhaps something like Kodak's Super-8 resurgence can bring back the idea of putting down the phones and watching a cinematic capture of skateboarding. One can hope. Bring back the glory of skateboard videos! Stance's American Daredevil collection is a great tribute to Evel Knievel I loved Evel Knievel when I was a kid. Seeing his stunts on Wide World of Sports was an amazing experience to me. Building bike ramps with my friends was my way of trying to be a part of what Evel achieved. From books and magazines, I just couldn't get enough of him. The year I had an Evel Kenievel Halloween costume, my parents had a tough time getting to to ever take it off. Every day warranted an Evel costume. On my bike in that red, white, and blue outfit 0 I was invincible. Or so I thought. Stance's American Daredevil collection brings several designs capturing some of Evel's logos and style. American daredevil Evel Knievel did things other men were afraid to do. He jumped motorcycles over boxes of rattlesnakes, from skyscraper to skyscraper, over busses, and rocketed over the mighty Snake River. He believed pain made him appreciate life, dreams were meant to be followed, and every crash was a success as long as he got up. We celebrate Evel Knievel's legacy with designs inspired by his iconic style and spirit. 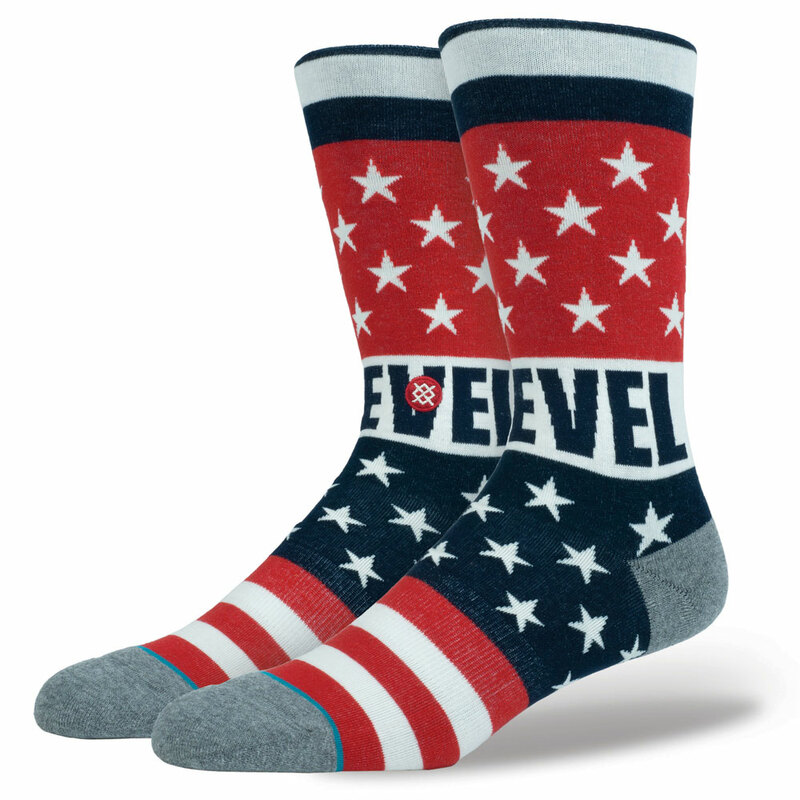 Introducing the Dare Devil, part of the Evel Knievel x Stance collection. 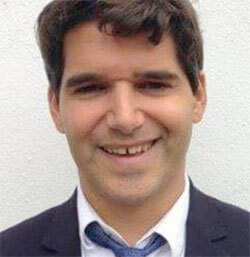 Spanish skateboarder posthumously awarded one of Spain's highest honors after London terror attacks The country's government has deemed him worthy of the Grand Cross of the Order of Civil Merit for his bravery. Ignacio Echeverria reportedly tried to fight off the terrorists with his skateboard to save a stabbed woman. He became one of eight victims of the assault on the London Bridge area. The foreign ministry in Madrid said: "His bravery in standing up for a defenseless person is a reminder of the need to remain united in the face of the scourge of terrorism." 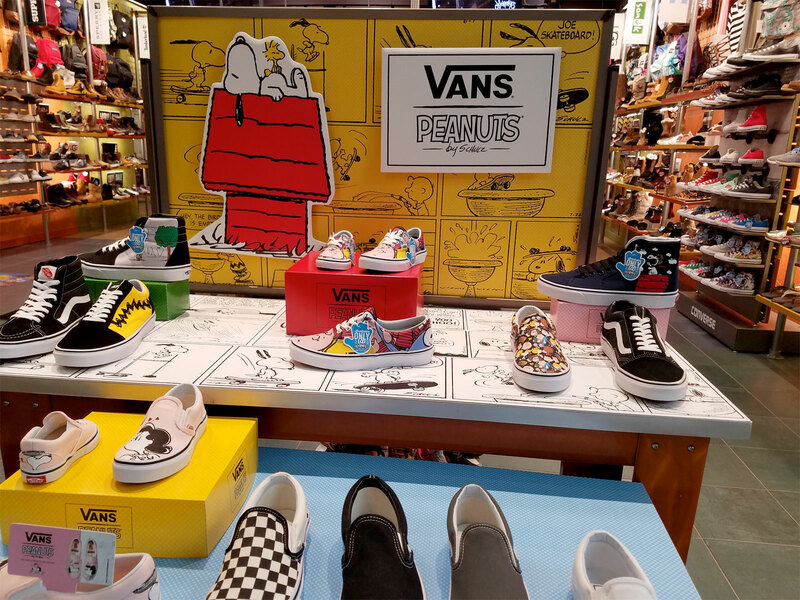 I'd heard of Vans releasing a Peanuts shoe line and was stoked to see it locally I grew up with the Peanuts gang in the Sunday newspaper comics and collected books full of Charlie Brown, Lucy, Linus... wow the memories come rushing back! Vans and Peanuts are back with a new collection featuring Charles M. Schulz's iconic characters and guaranteed to be Joe Cool-approved. Created with vintage artwork from the '60s, '70s and '80s. 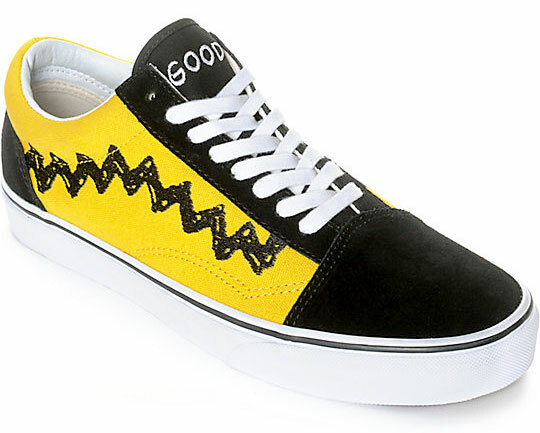 As a longtime fan of Vans slip-ons, I love the designs, but I'm really loving the yellow shoe with Charlie Brown's signature shirt. Thrasher once sold a hat with that theme - the Gnarly Brown.